Yeah, brilliant. https://admin.fedoraproject.org/updates/search/kernel seems to display more up-to-date information. Thanks. Because of this kernel 3.19.1 I can't install virtualbox from repos ( I work with ). So I made a dualboot with Ubuntu. yum install kernel-3.18.9-200.fc21 didn't work. Is there a way to manually install 3.18.9 ??? B- I installed Virtualbox 4.3.26 according to https://bugzilla.rpmfusion.org/show_bug.cgi?id=3568#c11 and all works fine. C- Plz aeperezt what means "Also try libvirt kvm manage with virt-manage Works fine for me" - did it replace virtualbox ?? create, mount VM's ?? 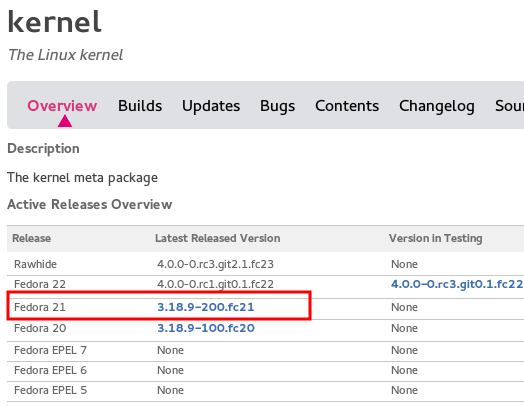 Virtualbox add some kernel modules to work with its hipervisor, Fedora update its kernels faster that Virtualbox. So to use Fedora you need to find the kernel that works with Virtualbox and update all other packages but the kernel until there is a new update of Virtualbox. But keep in mine you need to ask not to update the kernel on your repo files.